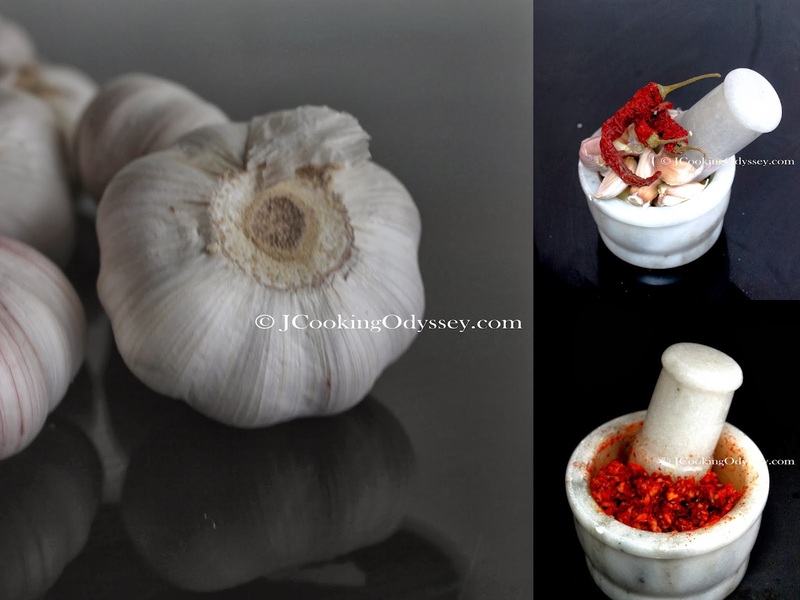 Jagruti's Cooking Odyssey: Versatile Garlic Chutney / Masala - Ramp Up The Red ! Versatile Garlic Chutney / Masala - Ramp Up The Red ! Today is Ramp Up The Red Day! The event where the UK gets together to raise money to fund heart research. And rightly so, circulatory diseases are the leading causes of death in the UK (in 2010). My son went into school wearing red! My daughter is a volunteer at the British Heart Foundation for the past year and a half now. The idea is to raise money for babies born with heart problems and to those who struggle with heart failure. In heart disease, or coronary heart disease, the blood vessels that supply blood to the heart become blocked, preventing blood reaching the heart. They can become blocked with fatty deposits. These fatty deposits can be caused because of a bad diet and lack of exercise. Eating foods high in cholesterol and saturated fat can cause this problem. The two main players in preventing heart disease is to eat healthily and to take part in exercise, something that we can all manage and control! Obviously as a foodie, I think about foods that can prevent these things from happening, so whilst I make a cheeky and sinful treat, I always go back to my healthy recipes! To reduce your risk of developing heart disease, there are numerous types of food recommended by the health experts and dieticians. Whole grains, beans and legumes, nuts, fatty fish, and teas are just as important as an abundance of fruit, vegetables and herbs in many colours, shape and sizes, While we are discussing about good and healthy foods, how can we forget Garlic ! Garlic is one of the most valuable, humble and versatile food on the planet, widely recognised for it's health enhancing supplement. Garlic is an excellent herb to create and maintain overall health. 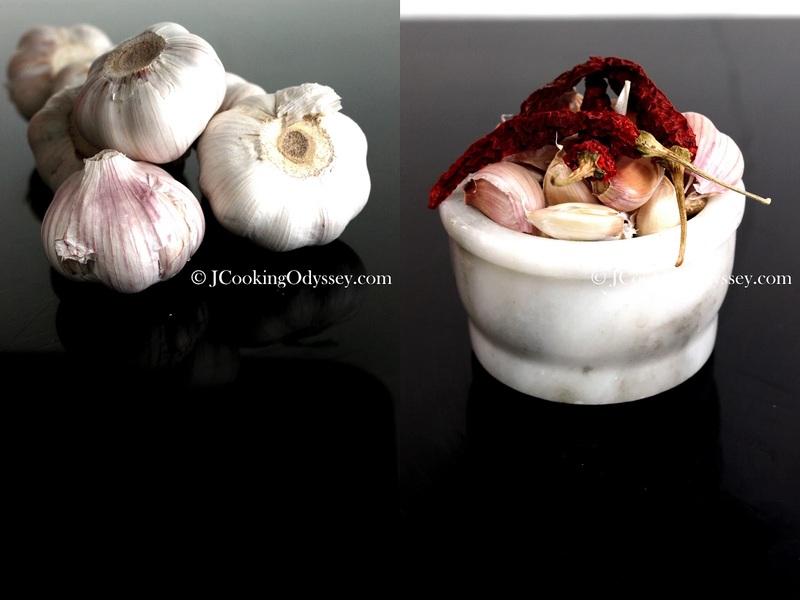 Any description of garlic is incomplete without mentioning its medicinal values. Either you want to treat infections, loose weight , protect your heart, combat many allergies or want to reduce your sugar levels then make garlic your best friend and give it a cosy place in your kitchen ! There are awful lot of benefits of Garlic, as long as you add in your everyday diet, you'll have a priceless medicine !!! Indian cooking is incomplete without garlic, very strong flavoured and bitter taste but adds and unbelievable flavour to that dish ! Either incorporate in curries, daals or chutneys , garlic enhances the taste. By now you must know where I am heading? Mum's recipe of Versatile Garlic Chutney, this chutney of hers was quite popular amongst family and neighbours. She used to prepare twice a year, this chutney can survive easily for six month, so she would prepare them in big batches and use it whenever required. After I came here, I found out that my MIL loved it too. Enjoy with any meal or use in many recipes when recipe calls for. I particularly love it with Millet flour roti and any type of khichdi. Ramp Up The Red ! 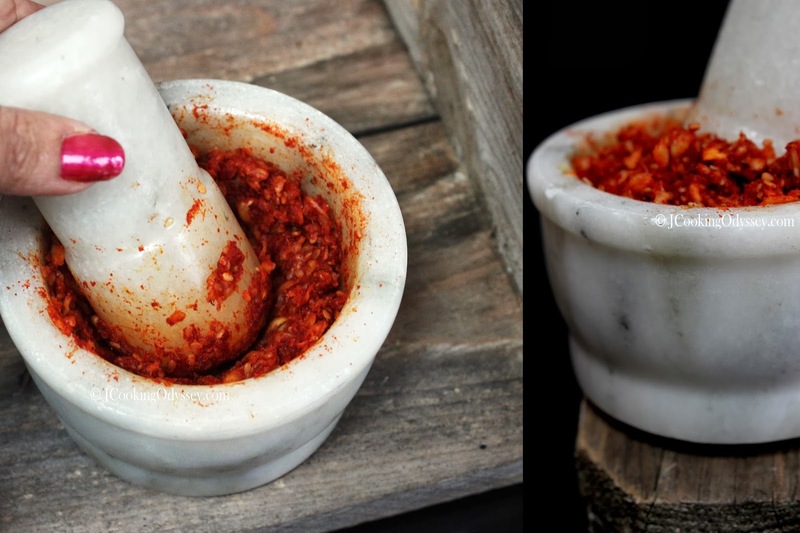 First ground garlic, using pestle and mortar. When you see coarse garlic add sesame seeds and ground more. Add salt and chilli powder and ground once more til every things blends together. Serve or transfer in a air tight container and store up to six months in the fridge.